Here is a very simple design of a world map that requires drawing a simple contour. It will copy the modern world’s map. 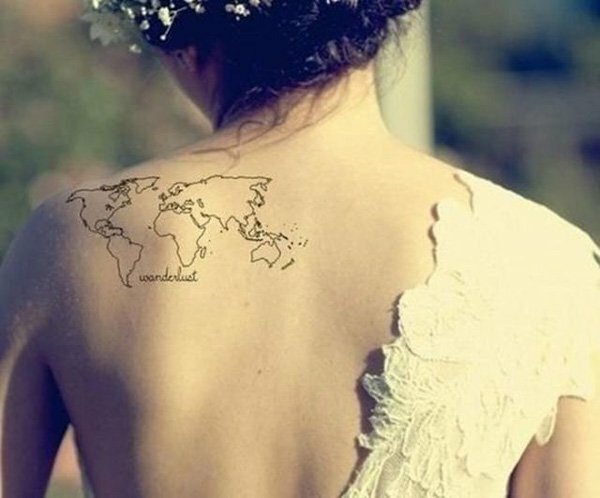 The tattoos with the world on a shoulder blade have become extremely popular due to the effects of modern globalization processes as you can travel all around the world faster and more effectively. Today it is possible to see more of the world for a single life time. Shoulder map will always remind you of it. See the all over back tattoo with several colored zones on it. In such an unusual manner a person can point out the places which are of some importance or of some peculiar interest. It can be also applied by those people who are passionate about unusual tattoo styles. 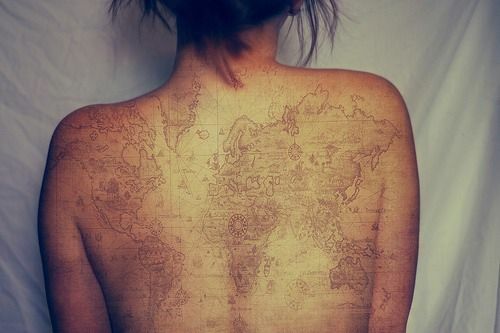 Having a world map on one’s shoulders cannot be called a standard tattoo that you can see every day. 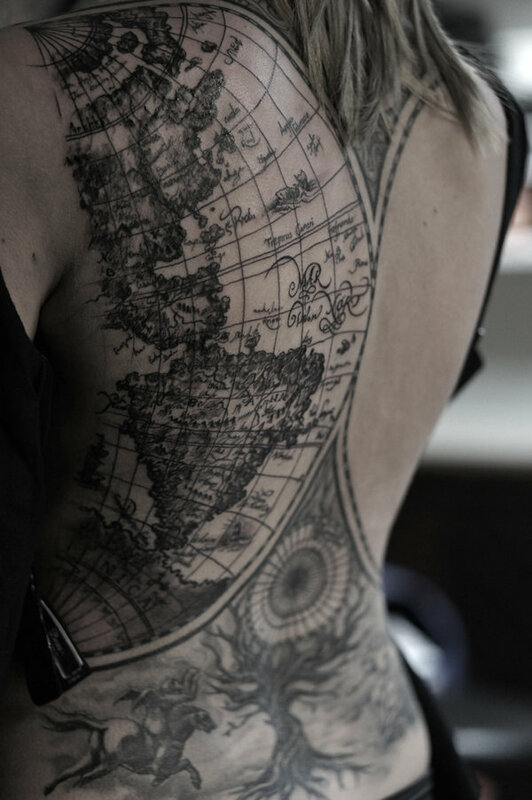 Old fashioned maps like this would be an object of a strong interest of many people who adore decorating their bodies with fashionable tattoos. 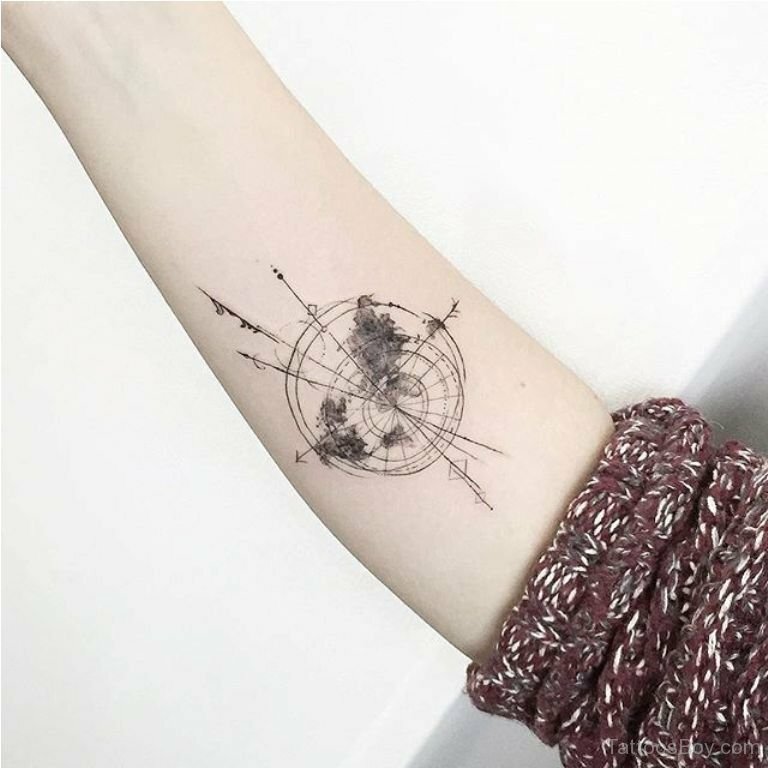 This piece of body art can boast with a fine design that resembles the old marine maps which were used several centuries ago during long stormy voyages. The map has got a very authentic look as if it was created by means of a charcoal. These two Americas on the back of the lady look really amazing. The artist managed to create a stylish old fashioned map of North and South America continents in a very elaborate manner. The author of this piece of work drew it in a globe hemisphere and put a lot of details into the art. 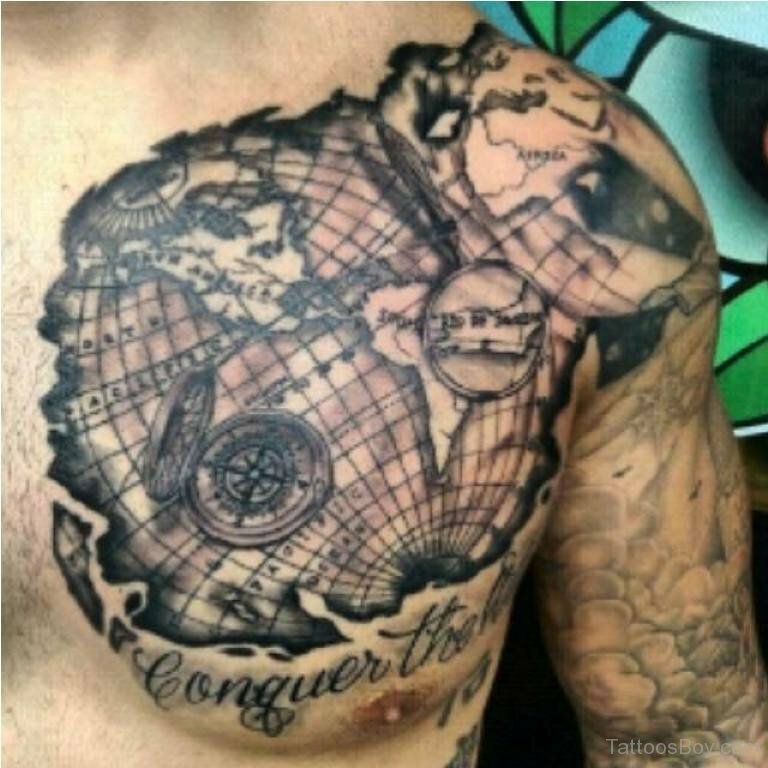 He didn’t forget about adding the meridians and even the line of the equator which separates the continents almost in the middle. There are plenty of options for stylish feet tattoo designs. In this case we’ve got a simple version of a world map that is not deprived of its romantic charm. 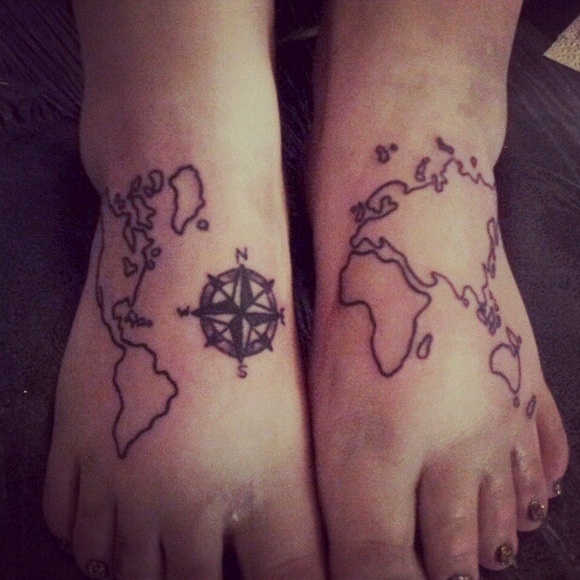 Half of the world is depicted on the left foot while another part is one the right one. And every step you make looks as if you are travelling the whole world. The compass in the corner symbolizes the tool that will always help you to return home. This tattoo demonstrates us an importance to be able to manipulate light and shadow while drawing a picture. As you can see the usage of dark thick lines added a great deal of volume to the body picture. Although we perfectly understand that this is an optical illusion, it is possible to think that beneath the skin of the person a secret map is hiding. It will lead to some important discovery. The recent fashion trend introduced a series of popular foot jewelry that should be worn exclusively on the ankles. The fashion lasted for several years but now we’ve got a totally new trend. This is a tattoo on a heel. It looks very smart and elegant and the mini map that is shown at the picture will not take much time to draw. It will be a fine asset to your overall style. What is the first word that is associated with adventures? – That’s right: travelling. The travel means seeing something amazing, awesome, unbelievable etc. The world is filled with interesting places that every person should see. This inspirational photo should serve as an excellent reminder of the importance to travel and see the vast world to get maximum impressions. The only thing that you will be lacking now is a parrot on your shoulder that will shout “Aye Captain!”, when you set sail to the next journey. 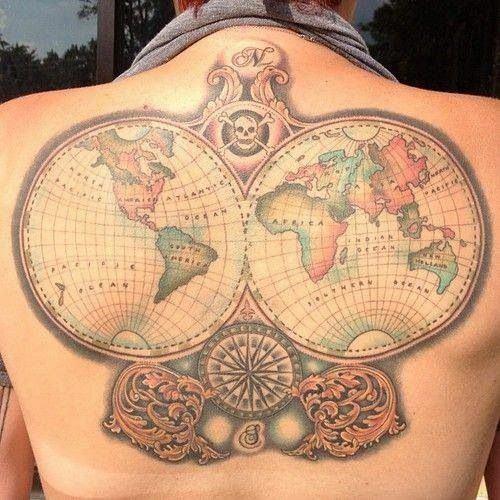 The best way to protect the map that may show the way to any treasure is to draw it on you. Thus nobody will know where they were hidden and you will be able to sleep tight knowing that all the richness is hidden in a reliable place. 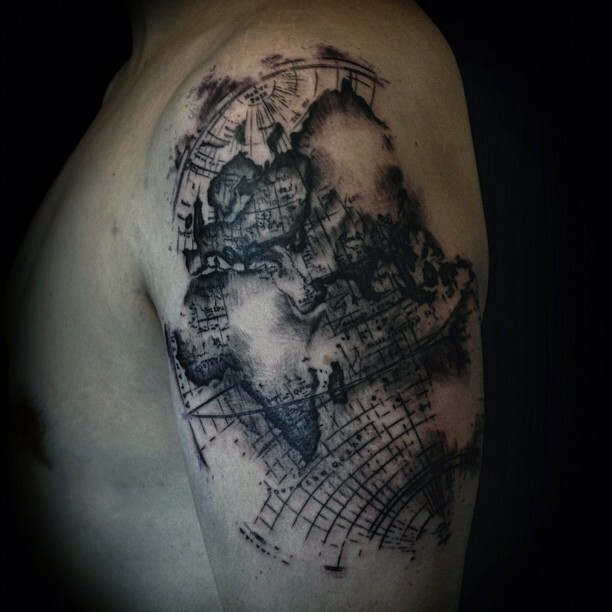 Another stylish map on a shoulder proves the fact that tattoo with a world can look really awesome and attractive. 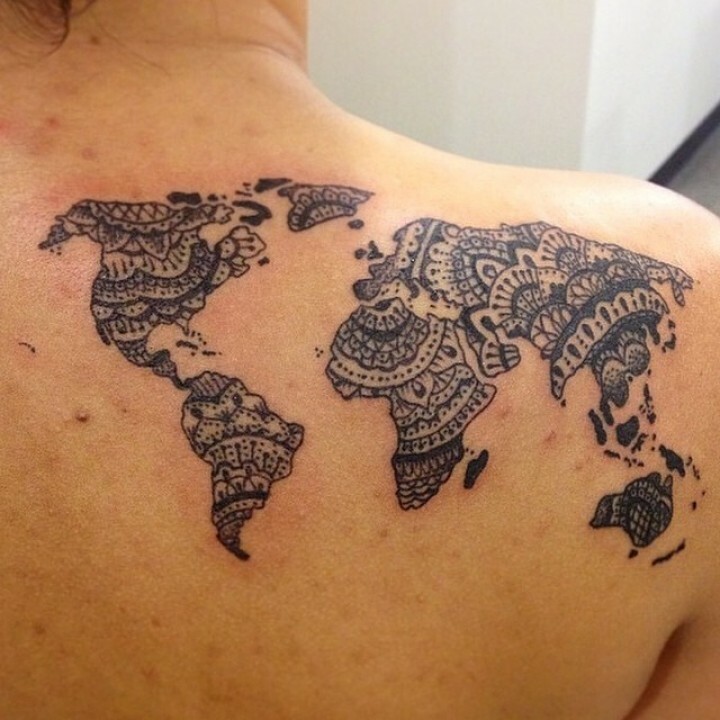 The tattoo of this style introduces us the utilization of the traditional ethnic patterns of some culture which depicts rich natural patterns that were drawn into the boundaries of a world map. It looks great in black and white and will look twice as awesome if performed in full color. 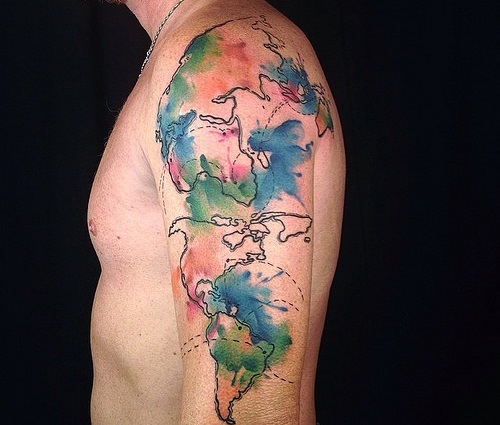 The bright colors of this sample of a map tattoo are surely worth of your attention. The contrast between colors and the compass through which we can see the cracks in the continents that are circling around create a wonderful optical effect. With such a great tattoo your shoulder will never look the way it did before. You will really satisfy your brand new look. Avant-garde art is extremely popular at present and the web is filled with the samples of such art. The tattoo designers decided to make their own pattern of this type of art. As the example of such style we can look at this map that seems as if it was done with an oil painting by means of rough and primitive technique that is characteristic of both Avant-garde and impressionist styles. 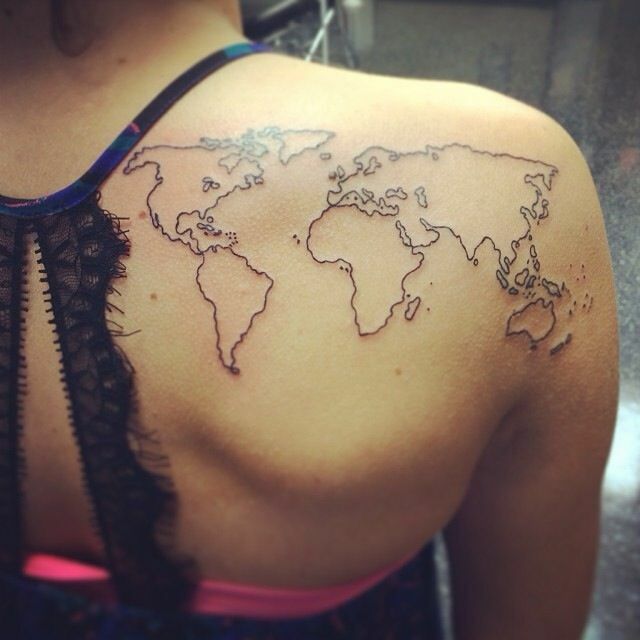 Where is the best place to put a tattoo of the world? – We think that the best way is drawing the map just beneath the heart as this is the most suitable place for a whole world. It can have two meanings. The first one is that your heart is so big that it can contain an entire world in it. The second one is that you are passionate about travelling and various trips make your heart beat faster. Move down to the South according to the compass. Be aware of the Kraken that is hiding in the blackness of the waters and turn around a solitary island. It will show you the way to the treasures you are dreaming of. 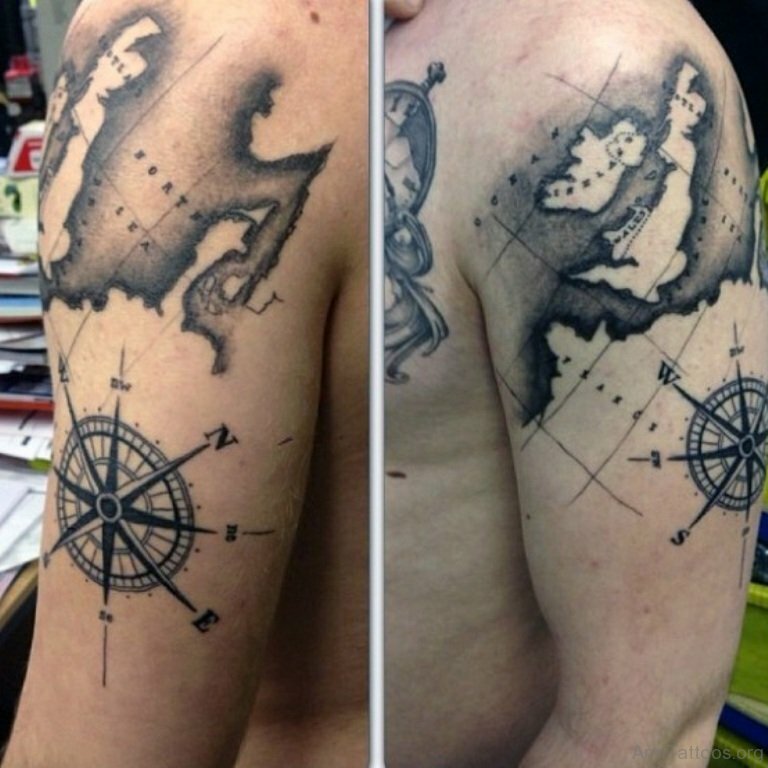 That is a really fine tale that this tattoo tells us by using black and white colors and images of a map. Do you want to go on a journey? With our modern technologies the world has become extremely small. You can use the web cameras to see the places that are thousands miles away from you. 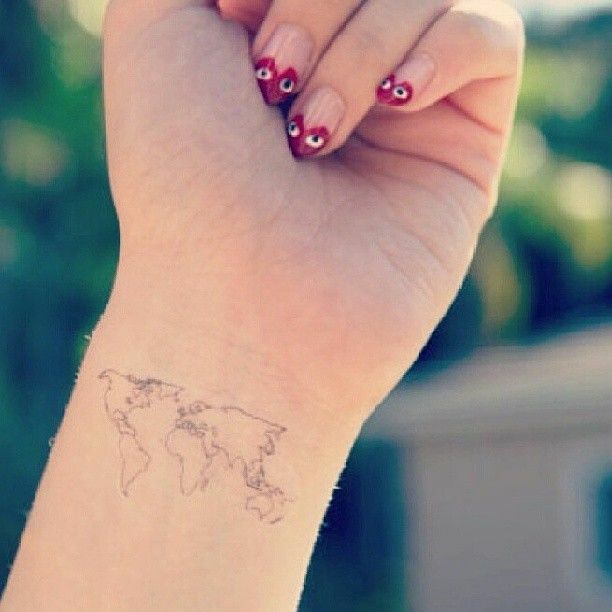 This cute tiny tattoo of the world on a wrist reminds us that the world has become really little and we shouldn’t miss an opportunity to see most of it during our lives. 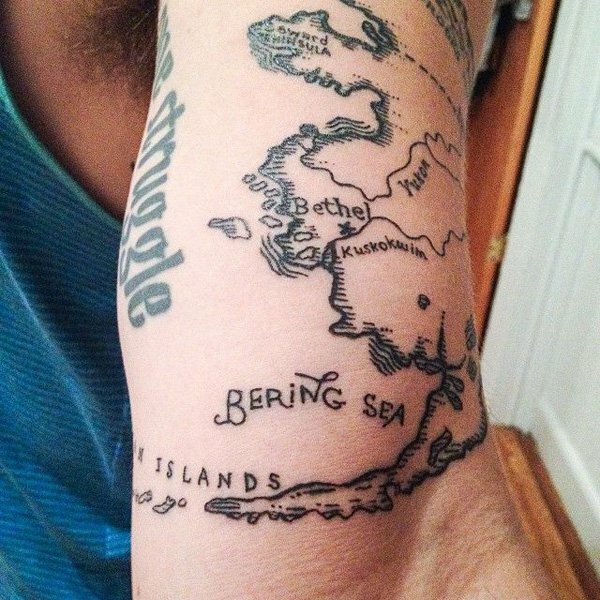 This map that was drawn on purposely in an old design seems to have been taking straight out of the cabin of some old sea wolf who spent all his life in the sea drawing the maps and travelling the world. The leftovers of ink feathers and compass show us that this map has a rich history and the owner of it cherished every line on its surface. 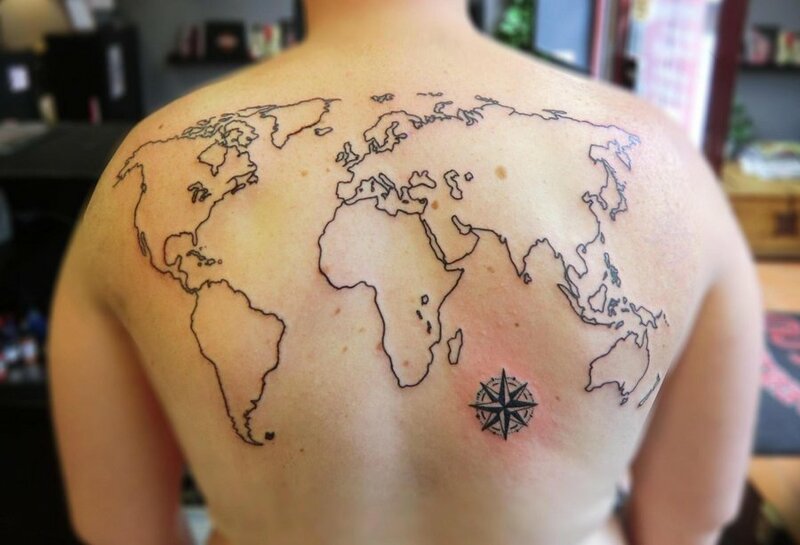 Now this map can be on your back. This art can be called a map in the mist as not all of it can be seen but only some part of it. The mist is made on purpose as when you pay a closer attention to it, you will see that this part of the map depicts Great Britain. Due to dense fogs it is often called a misty Albion. 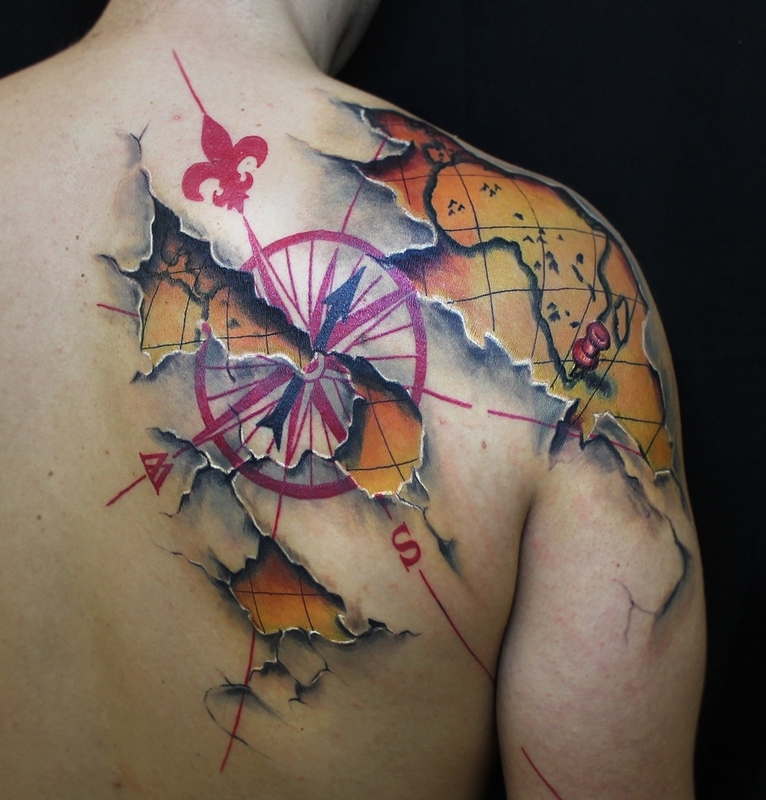 This map tattoo looks especially cool when a decent level of contrast is applied to it. 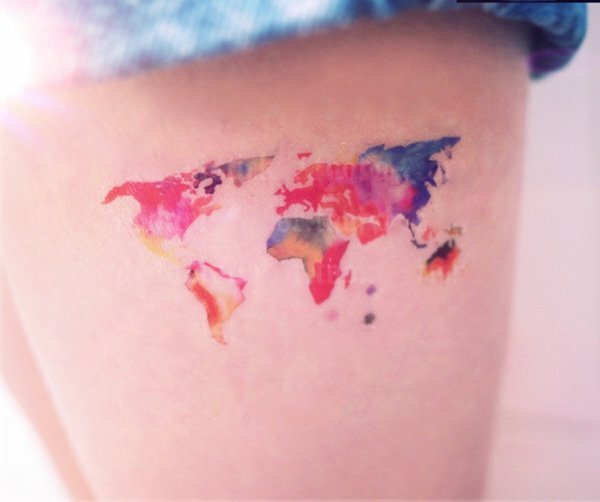 The colors of this cute little tattoo can’t do anything but fascinate the watchers with an outburst of colors. It’s hard to believe that so many colors and hues were placed into such a tiny area as if a rainbow was transferred from the sky to your skin. Regardless of the size the picture was made with a great detalisation and all proportions were preserved. We all inhabit the same planet and are a part of the same world. 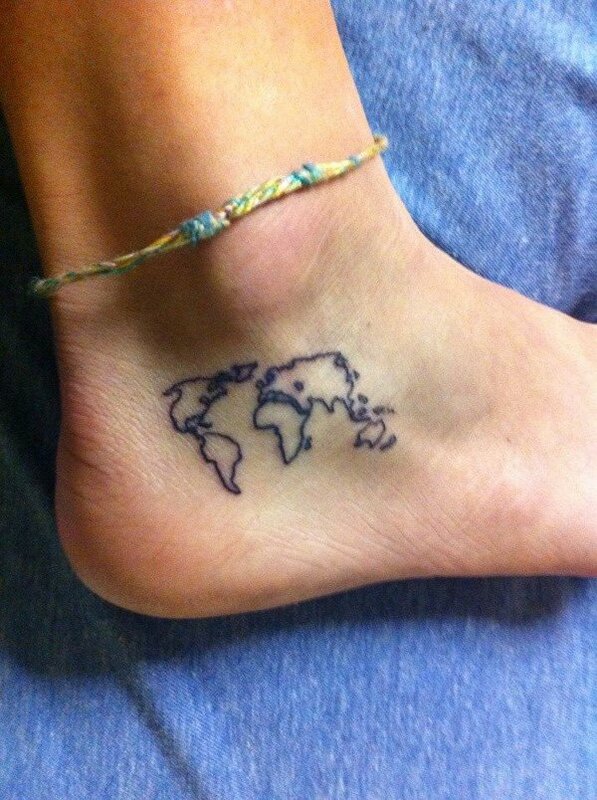 So why shouldn’t we make a world a part of ourselves by making such simple tattoo that will remind us about this simple truth? The contour of the map on the side shows that you are a real child of the world and admit no boundaries to your personality. See how much information a simple tattoo can give you. This is a map of the Incas motherland – the South America. It is done in a very stylish manner to be similar to the style of the maps that was used by the Spanish conquerors. The map was drawn in a very detailed manner and a lot of colonies were depicted there. All the words on the map were drawn in Spanish to look similar with the original. It looks really awesome on the wrist. This dark colored piece of globe reflects an old style world map that can be found in the atlases of the 18th century. It shows us the part of Europe and top side of the African continents. 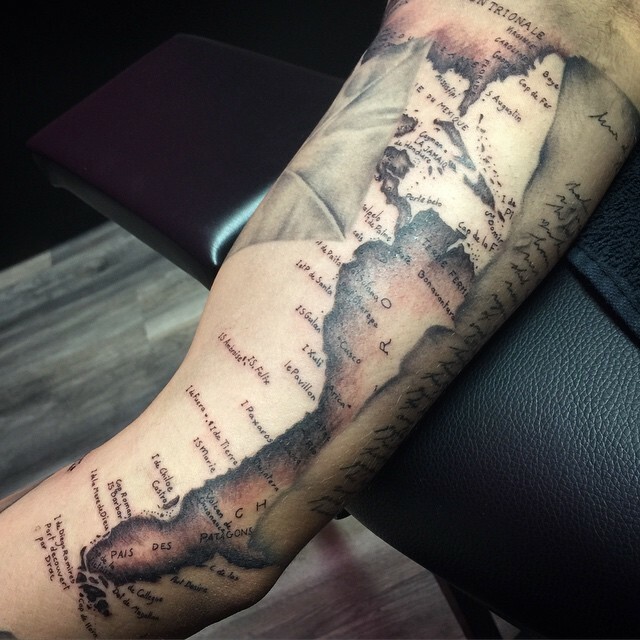 All the Meridians and hills were preserved in this map do add some volume and classic style to this tattoo. It has special brushed spots to increase the effect of the old. Simple outline tattoos are extremely popular with many people thanks to the variety of factors. They are easier to create as only an outline is done. The usage of the black ink and the amount that is necessary for drawing the tattoo decrease the price greatly. 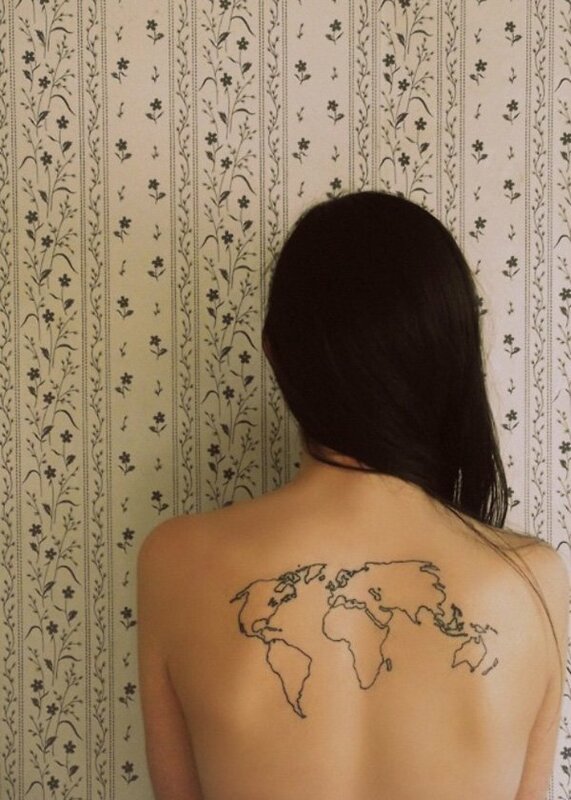 The world map that is drawn of the back looks like a pair of wings that were created from the planet’s continents. 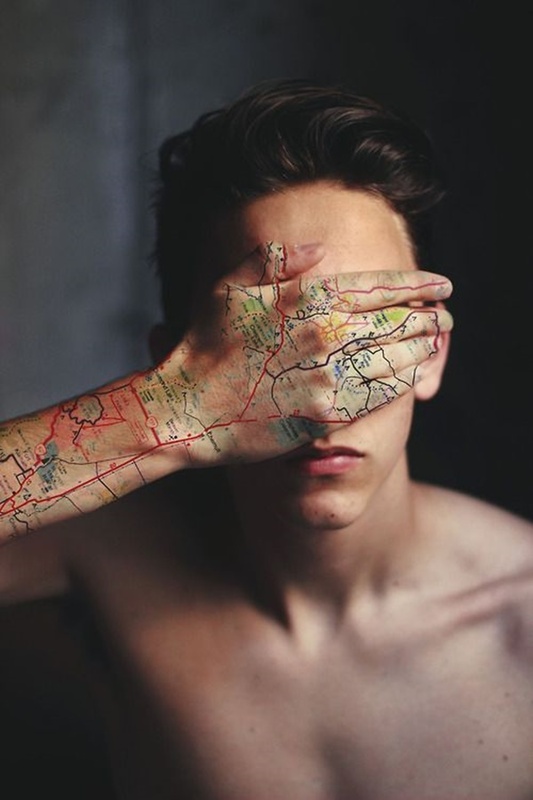 It is always convenient to hold a map at hand, even if it is just a draft. 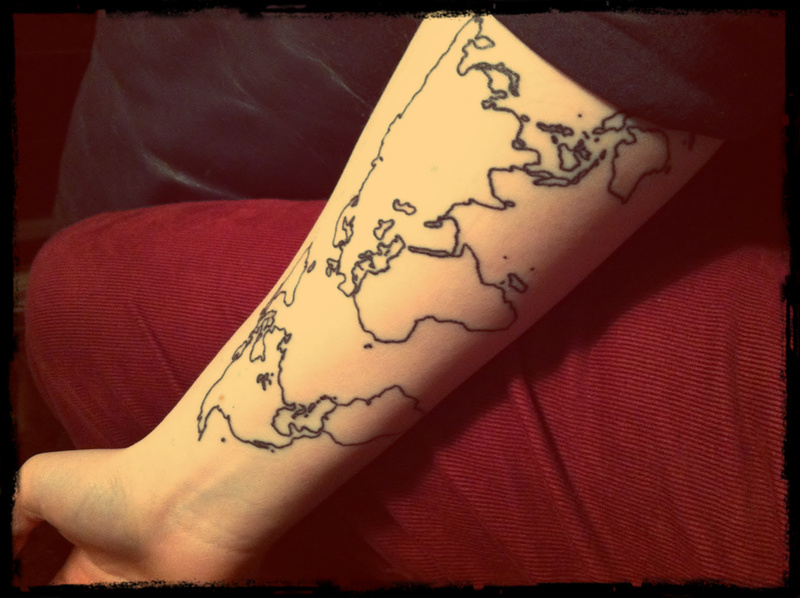 Technically saying a simple outline of the map would be enough for a person who knows the map of the world and knows how to orient in it. For those who are not interested in any practical aspect of tattoos this picture would be a fine wrist décor like a fancy bracelet or a watch. 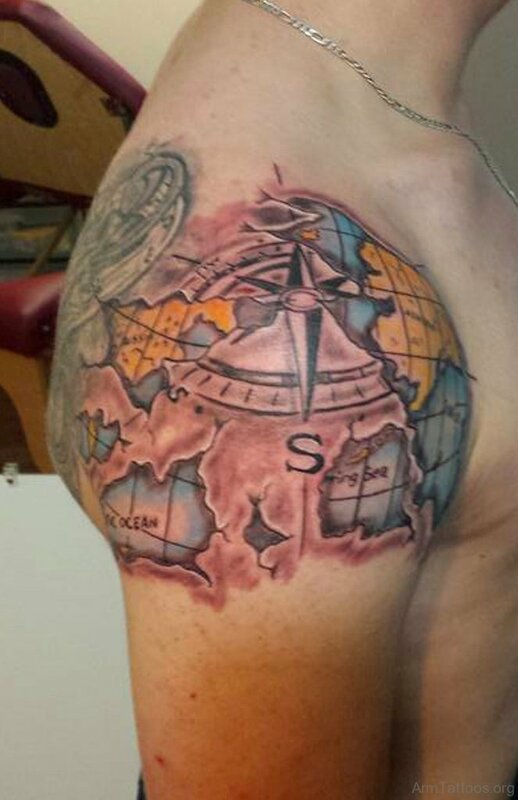 There is some really cold air emanating from this tattoo and all because of the places that are depicted on it. These places can proudly wear the title of the coldest in the world. The Yukon and the Bering Sea are the spots to which there were many expeditions conducted in order to explore this territory and prove that it is possible to live here. 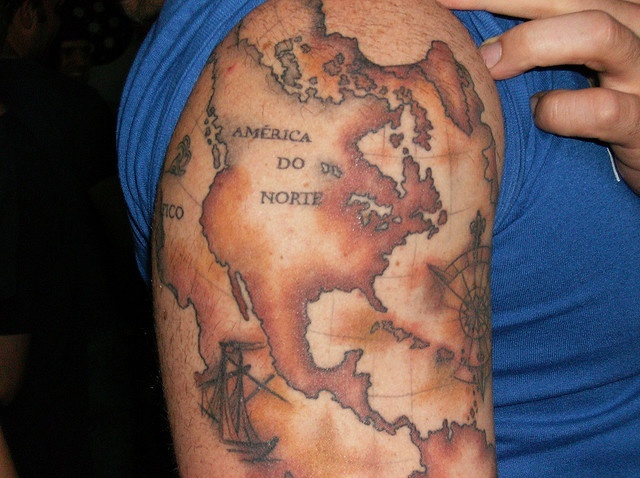 This is a totally unusual solution of the map tattoo. In order to draw it on a single shoulder, the designer decided to create a tattoo in a vertical manner. We can see the Europe on the top that is followed by Africa and the Americas. The body picture is modified with chaotic colors that are very similar to Indian Holi colors. 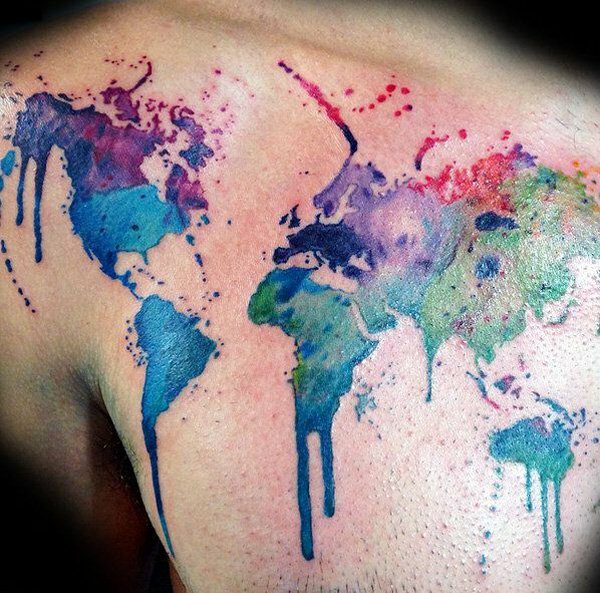 Overall, this tattoo is an outburst of colors which is destined to drive attention of people to it. 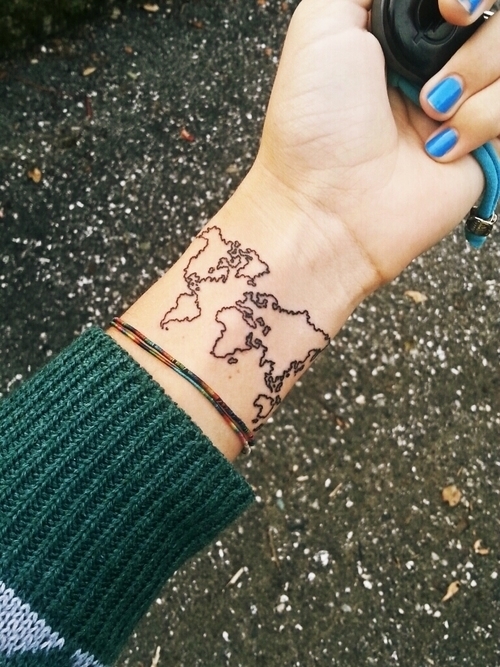 A tiny Earth globe on the forearm would be a decent tattoo idea for those people who are searching for unusual tattoo solutions that will look smart and cool. The globe is created with slightly smuggled style as we can judge by the images of the continents. The arrows that pierce through the sphere are the axis of the planet. They finalize the image, making it look as if it was a fancy wrist watch. 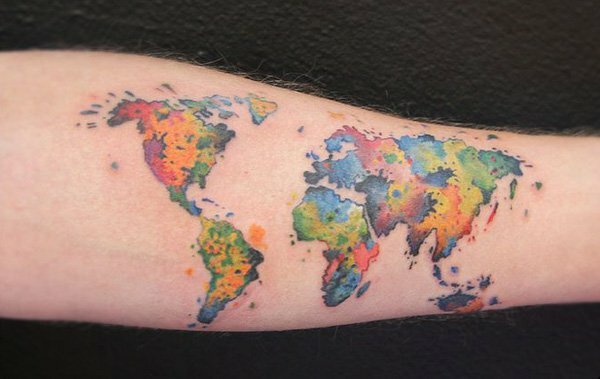 It seems that a bomb with paint has burst out and took the shape of the world’s map on the forearm of the person. The colors of the picture are extremely bright and it is really hard to find the color that is missing in this fine composition. This is a really positive tattoo that will bring you some good mood any time you will look at it. 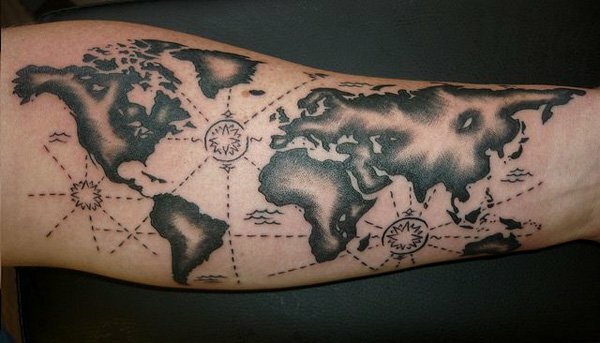 This is a simple tattoo on the forearm that is composed of a single thick contour that copies all six continents of the planet. It looks very reserved and doesn’t drive a lot of attention if compared with previous bright options. So if you want to make a tattoo that will not disturb the minds of people around you, pay attention to this modest design, perhaps it will suit you well. 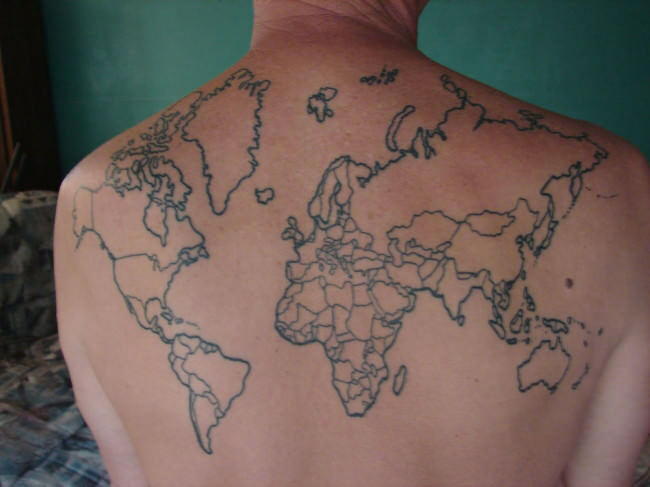 The roads are really endless and this tattoo finely depicts that. All you need to do is close your eyes and imagine where you want to go. The tattoo will always remind you that there is a limitless amount of choices. Just turn at the fork and make another choice and then another until you finally make the best possible choice on the road of life. 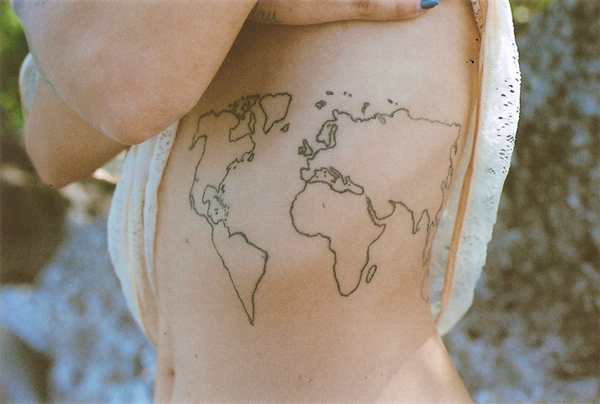 This is a really romantic map for a tattoo design. It involves a usage of a beautiful white rose and a looking glass. These simple elements inspire travelling over long distances and visiting some marvelous places that are in a great abundance in our world. The art sample in which all the elements were presented would look really lovely for both men and women. Perhaps, these were the first maps drawn many years after Christopher Columbus has discovered the American continent. It was specifically painted in faded away colors to match the historical period of time when such maps might have been in use. The language of the map is Spanish as if to emphasize the nation who was ruling the oceans at that time. The map of such kind might have belonged to some famous admiral like Trafalgar. There are some magnifying glasses that will enhance the view of the details and a compass so that it was easier to navigate in ravaging seas. 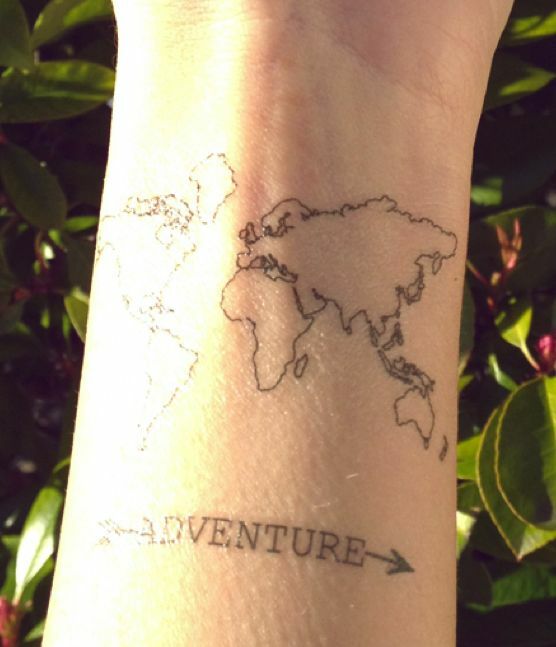 With a good map at your hands you will be able to conquer the world. The tattoo with such a style will definitely come to your favor. There are so many people and so many places to see! This is what this tattoo tries to tell us. There is always some place to go to and something to see. You don’t have to worry that something might go wrong. Worries bring nothing but waste of energy. You can always select another place to be in this big beautiful world that is filled with opportunities. 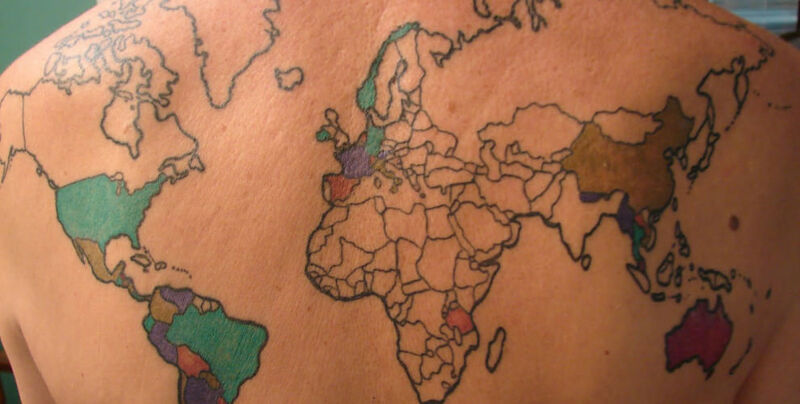 This is a really large political map that occupies a lot of space on the back of the owner. All the borders between the countries are strictly met and it is possible to find almost any country here. It has one interesting way of utilization. If you are crazy about travelling and can’t imagine your life without packing a back and setting off on trip to some place, you can pick the colored ink and mark each country you’ve already visited to see the progress of you journeys. 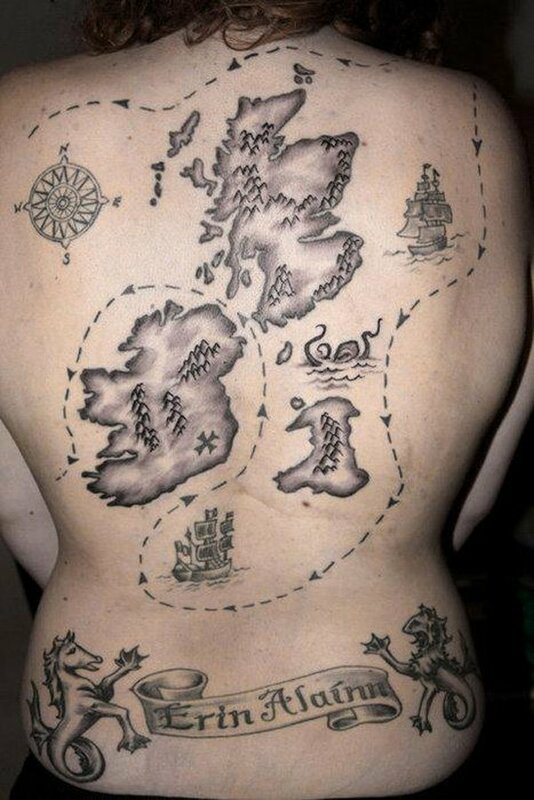 Here is another thematic map that would serve as a fine inspiration idea for awesome tattoo designs. This time we’ve got a fine tattoo that is made in a shape of a page that was torn out of some book of maps. The author even managed to add the fragments of the page’s ripped tips. It depicts the historical map of the Greece’s conquest by the Roman Empire. 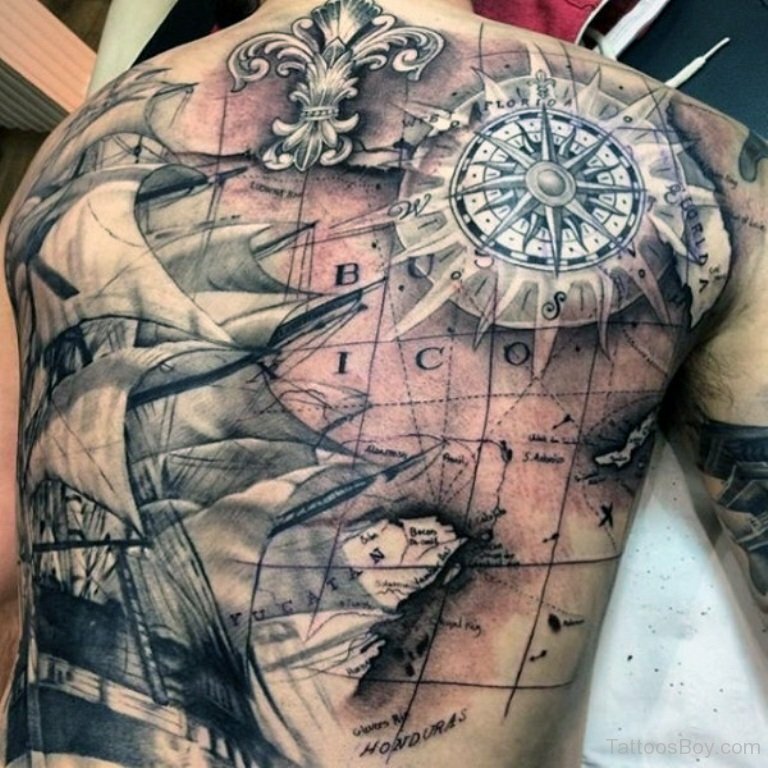 This luxurious full back map with a ship can be boldly entitled a real masterpiece of tattooing art. Have a look at the texture and handwritten text – they are really worth of public recognition. Who might imagine how many hours did the artist spend to craft such an awesome creation?! The old Victorian style really transforms the look of the map to a totally new level of beauty. The map on the back is introduced in a very decent scale so that it would occupy almost the whole space of the back. 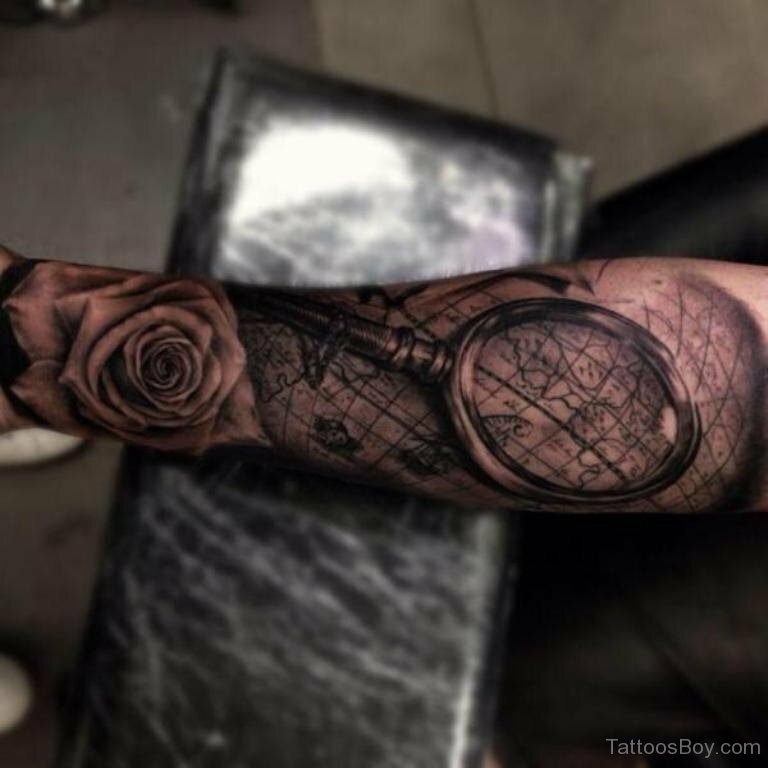 It looks really gorgeous as each detail has been elaborately crafted with a tattoo needle with addition of some fine sepia effect to maximize the visual effect of the design. It makes the tattoo look as if it was printed on some sort of parchment. The art at the back of the lady demonstrates an outline of our planet’s continents with a single signature that can be read as “wanderlust”. The world map is the best thing that characterizes this word as travelling is a constant shifting of places and desire to see more. The world offers endless opportunities of new experience and we shouldn’t ignore it.